With the legalization of recreational marijuana use in some states, the pot industry is rapidly expanding. In a study by The ArcView Group, the marijuana industry is one of the fastest growing markets in the U.S. with a 74 per cent increase from $1.5 billion in 2013 to $2.7 billion in 2014. By 2019, the industry is expected to be valued at $10.8 billion. The amount of consumers, whether for medical or recreational, has also risen. In Colorado alone the number of patients approved for medical marijuana cards rose from 80,558 in 2011 to 111,804 by the end of 2014. With marijuana consumption on the rise, companies are finding innovative ways for the consumer to get high, no longer being confined to the two traditional methods: smoking or baking. These new innovations are making typical pot smokers look like luddites in comparison. From edibles ranging from hard candies to cannabis-spiced almonds, pot-products have taken a more casual approach, trying to erase the negative stigma associated with the drug. 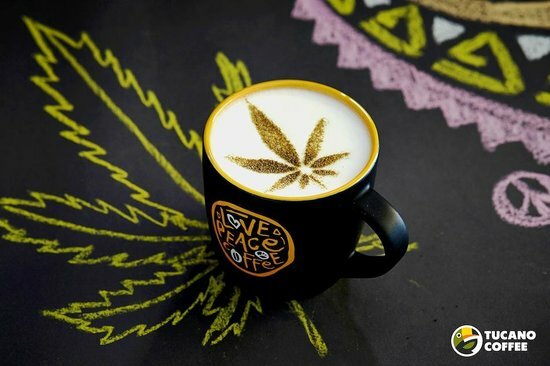 What is said to top the new forms of consuming cannabis is marijuana-infused coffee. Starting your day on a “high note,” the Washington-based Company Fairwinds Manufacturing has created a marijuana-infused coffee brew that provides an “extra kick” to your morning. The coffee is sold in Seattle’s Uncle Ike’s Pot Shop. Uncle Ike’s sales manager Jennifer Lanzador compares the energy boost of the cannabis coffee to that of Redbull and Vodka, according to Yahoo. “I had more energy, but I still had the relaxation you get from cannabis,” Lanzandor said. House of Jane, a California-based coffee brewing company also sells cannabis coffee with a variety from medium roast, dark roast, decaf and mocha. The five-month-old company is looking to expand by adding stores in Nevada and additional flavours such as a Frappuccino. According to their website, the effects after consuming the coffee begin within 15 minutes and lasts from three to five hours. Originally for recreational purposes, the company plans to move toward medical marijuana. According to IBISWorld, more than half of all marijuana revenue this year is expected to come from edibles.